Nothing captures the holidays more than sparkling beverages. These delectable, tasty beverages truly represent the holiday season to me. Serve a sparkling cranberry mock tail with a slice of lime on the side for a fun non-alcoholic drink. You can even use the cranberry juice as a mixer too, if desired. With some yummy hors d'oeuvres on the side, your guests will be partying in style. 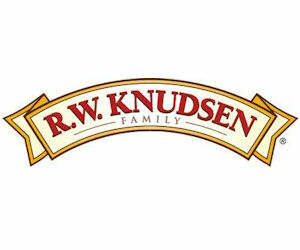 RW Knudsen brand's diverse offerings include natural sports drinks, more than 125 types of natural, organic fruit and vegetable juices, elegant celebratory beverages, bubbly Spritzers, sparkling essences and sensible sippers juice boxes. In keeping with "family tradition," the R.W. Knudsen Family® products are still made from 100 percent natural ingredients without any added sugar, preservatives or artificial colors. I've been aware of R.W. Knudsen beverages for years and they are always quality made and truly delicious. The fact that they are produced without any unnatural additives makes it all the better for me. These drinks are best served ice cold. I was sent four bottles of delicious sparkling drinks. They all looked fantastic and I couldn't wait for the taste test. I received cranberry, apple, blueberry and pear. These drinks would be fantastic for Christmas, and they would also make a fantastic New Years Eve drink, if you don't drink alcoholic beverages. The celebratory beverages are packed in elegant champagne-style bottles, perfect for special occasions. Why not have them for a pop of color on your holiday table, or give them as a hostess gift? The apple was my absolute favorite. The pale yellow color was very nice, it almost looked like wine! The beverage was delicious and very refreshing. You could definitely taste the apple flavor, but the flavor wasn't overwhelming. The taste of the apple was very fresh. I liked that the beverage was organic, which is important to me. The juice was sweet, but not overly sugary. When you sampled the beverage, the taste of apple was prevalent, as was the carbonation. The carbonation was not over the top, but gave the beverage some much needed pizazz. The bubbles most certainly make the drink. The blueberry was also great. The color of it was a deep blueish almost purple color that was just gorgeous. The flavor of blueberry was prominent. Sometimes blueberry drinks can taste artificial, but this truly did taste like fresh blueberry juice. The carbonation level was subtle but noticeable. I loved the combination of sweet, tart blueberries with addictive fizziness. It's a pairing that you can't go wrong with. I don't like pears much, so the pear beverage was not one of my favorites. I tried it and it wasn't bad though. If you do like pears, you'll definitely love this beverage. The cranberry beverage was the last one I tried. I enjoyed this one as well. It had a gorgeous rosy color that I absolutely loved. The taste of it was sweet, but not overly sweet. I love cranberries so I knew that I would really enjoy this beverage. The level of the bubbles were perfect, not too much but just right. The drink was tart, just like how fresh cranberries were. The tart taste matched with the fizziness was right on key. It was smooth going down and left you wanting more long after your glass was emptied. This drink would be great served with a nice slice of pie or cake. I highly recommend R.W. Knudsen beverages for your Christmas holiday. 1. I will be picking THREE (3) winners for this contest. Three winners will win an assortment of celebratory beverages from R.W. Knudsen. Winner will be chosen on December 28, 2011 at 10 pm and then will be emailed. I like the apple beverage flavor. Subscribe to Sammi's Blog of Life via Google Reader. I've just recently discovered sparkling drinks ... I love them! My favorite, so far, is apple. Thanks for this opportunity! I like pear the best. I have not tried any of them yet, but I would llike to try the blueberry. The cranberry flavor sounds the best. I follow you on Twitter as @one_of_three. I like R.W. Knudsen on Facebook as Erin A.-L. I'm torn between Pear and Blueberry. They both must taste exotic. Please accept my entry. Thank you. I like the pear! Happy holidays! Thanks so much for the fantastic giveaway! I'm not a fan of pears either. I like the cranberry but would like to try the blueberry. I love blueberry and pear flavors the best! I love Cranberry the most!!! I like strawberry banana flavor best.